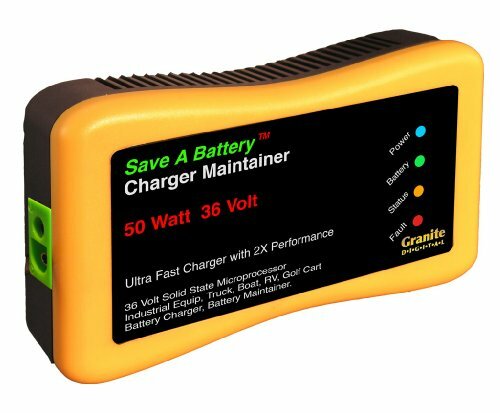 Save A Battery 36 Volt Battery Charger Maintainer charges, rejuvenates and extends battery life the longer it is plugged in. This battery maintainer offers a modular design for versatile operation cables that can be changed quickly and easily. It makes it easy to connect cables with total versatility. It charges dead batteries quickly using pulsing technology. This battery maintainer is lightweight, compact and easy to transport. Purchased this charger / conditioner specifically for my 36V SLA battery packs on my electric bike. Bike is my daily commuter and had been only charging at home. This charger is small and light and fits in my controller bag on the bike and allows me to charge the batteries up at work as well as at home. I have noticed a significant improvement in my SLA battery packs. I am now getting a few more miles per charge out of them and better high current delivery on inclines. My batteries are at least four years old as of the date of this review and were not new to me to start with. They were salvaged from a UPS system in a computer data center. I would have to say this charger is well worth every penny, a quality built product and still less expensive than other chargers that HAVE a proper conditioning / desulfate cycle. UPDATE 2011-07-28: Still going strong. Rides with me on my Ebike/electric bike in a handle bar bag along w ith motor controller to charge at work and at home. Does not get hot while power charging two 36V 7ah battery packs (2x3x12Vx7ah) SLA's are REALLY old now and still pushing me 11 miles each way and up one long hill in each direction. I still highly recommend this charger. This charger replaced my (third) Soneil 36v charger I use for my commuter electric bike. I noticed an immediate improvement in battery performance after switching to this charger, and a gradual improvement over the next couple of weeks. I'm impressed, and the plug connections at the charger are much sturdier than the molded strain reliefs on the Soneil. Those strain reliefs have been the downfall of each one I have owned. Wish I had bought this charger earlier!